(Nanowerk News) Robots can change directions, speeds and even their colors. But what about changing their shapes? With help from a sculptor's intuition, Yale researchers are on it. 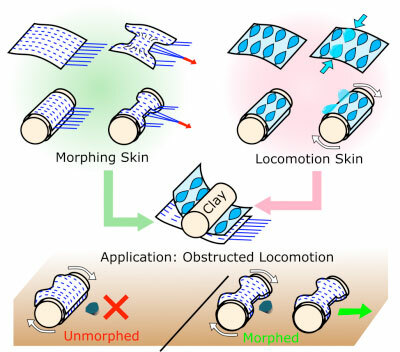 Led by Rebecca Kramer-Bottiglio, assistant professor of mechanical engineering & materials science, researchers developed a robot that can morph to accommodate changes in its path or environment. For instance, if a cylindrical robot finds a rock in its way, the robot can take on the shape of a dumbbell by cinching up its midsection, and pass over the rock. 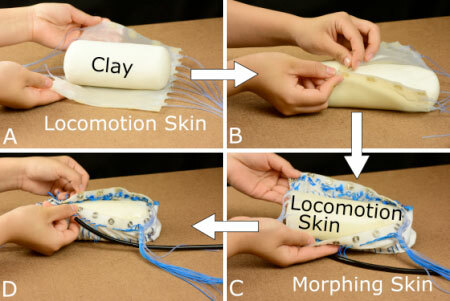 The results of their work were recently published in IEEE Robotics and Automation Letters ("Morphing Robots Using Robotic Skins That Sculpt Clay").